I’ll admit to having read and dismissed Achewood in the past. As webcomics go, it felt a bit too much like one of those continuing comics where you have to know the characters and have a sense of the whole story in order to “get” what’s happening in the comics. It turns out, that seems to be mostly just Chris Onstad‘s wry and absurdest sense of humor at play. When Sharyn asked if I wanted to read The Great Outdoor Fight, I remembered basically nothing about Achewood, and thought, sure I’ll give it a shot. 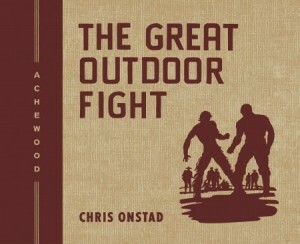 I’ll also admit that before I read this, but after I read the two mock non-fiction introductions about the history of The Great Outdoor Fight, I didn’t honestly know whether the event was real or not. Yes, I had to google for it. Then, I wikipedia’d for it. The answer: No. It is not a real fight. It is just a funny premise for this comic. This physical collection is supposed to contain some material not found on the website, including the two aforementioned introductions, and some stuff in the back of the book, like a page of recipes, some fighter/character biographies, and some blog posts written by one of the characters in the comic. If I were an Achewood fan, I would be really happy to own this collection. Even admitting that I’m not really all that much of a fan, I still enjoyed this book more than I expected to, and would probably recommend it to anyone who wants to read a silly story about a giant brawl that takes place annually over the course of three days. This entry was posted by Martin	on Thursday, October 16th, 2008 at 11:58 pm and is filed under independent, TPBs/graphic novels, webcomics. You can follow any responses to this entry through the RSS 2.0 feed. You can leave a response, or trackback from your own site.